1. LOVE HIM. Matthew 22:37. Remember that crazy love you had for a boyfriend or girlfriend that may or may not have become your spouse? Passionate love convincing you that you couldn't live without them. Love Jesus like that! You really can't live without him. 2. LOVE YOUR NEIGHBOR. Mark 12:31. If you love your neighbor as yourself, you'd grill him a steak or have the pizza delivery guy stop at her house before yours. 3. REMEMBER HIM. I Corinthians 11:24-25. When is the last time you took communion in his honor? 4. BELIEVE HIM. John 14:1. Believe him like you believe your power bill will come in the mail this month. 5. HAVE FAITH. Matthew 21:21. I'd like for Steve to wake up one morning, look out our window and notice Fort Mountain has moved, even if it's an inch, he'll notice! Then I'd like to say "Yeah, my faith did that!" 6. JUDGE NOT. Matthew 7:1. Jesus is my measuring stick. I said "my" not "yours". 7. SHOW HIM OFF. Luke 8:39. Your child scores the winning run. Do you relive it over and over by telling everyone you know and some people you don't? Tell others about Jesus with the same enthusiasm! 8. PRAISE HIM. I Peter 2:9-10. Can't think of anything to say? Sing that song you learned in Bible School to him. Praise him, Praise him, All ye little children, God is love, God is love. 9. THANK HIM. I Thessalonians 5:18. For EVERYTHING! Don't leave anything out. 10. LIVE. Luke 20:38 Need a little extra life in you? Read the scriptures I've noted. God's Word is alive. If you read and believe (oh, and also please), it will put some pep in your step! 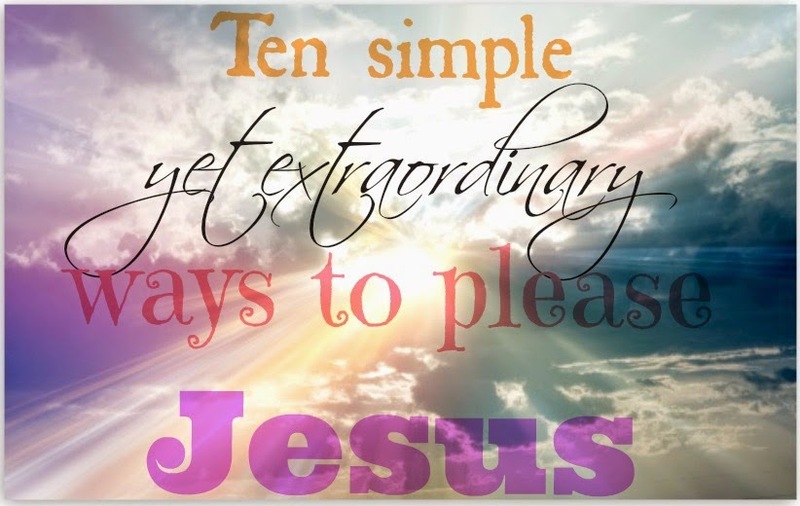 Can you think of ways to please Jesus to add to this list? Leave me a comment with your thoughts.